Despite looking through the manual for my 150hp Yamaha, the sequence of button presses to get my gauge to read knots instead of miles per hour, remains a mystery. Is anyone here expert enough to know from memory what buttons to press! Have no idea about the sequence, though; don't have them here. I'll try and remember to look that up on Monday. Switches around the back? The manual doesn't mention that! I'm not sure I can get around the back! I'm a big chap and wouldn't be able to fit between the jockey seats to get under the console! In the gauge manual it says - "you can select to show miles per hour...... or knots... see changing settings custom mode..." But it's not shown as far as I can see. I might try with mirrors and a torch next time I'm on the boat to see if I can reach around! Neil. if Your Ribeye is set up in the normal way with gauges you should be able to unscrew the top front section by the screen and just lower this section carefully forward with gauges attached and then you can play with connections etc. (do not know about those switches but certainly you should see them if present) I fully understand you cant get into the locker that way and would not recommend it. See attached Pic, undo the screws around the top (which is a graphite colour on mine and yours I guess is white)) then all attached gauges will come forward, be carefull as all wires attached. 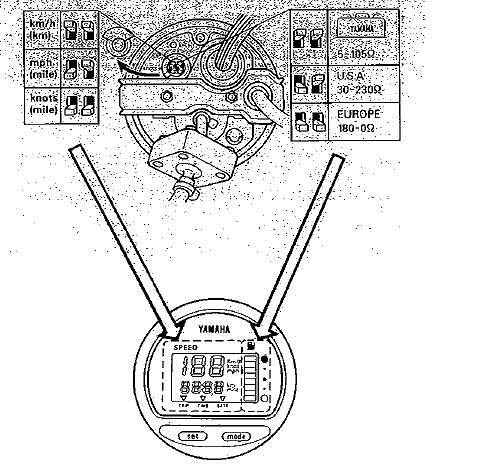 The pic shown above is from the original manual of the 6Y8! No chance to reach those microdips while the gauges are fitted to the console. 4 sure you have to remove the gauge. Hi Trolli, I have the manual too (2nd edition January 2007) which I assume as it's a 2009 engine is the most up to date edition. There are no pictures of these dip switches anywhere in my manual. So I appreciate you taking the time to scan and post that picture - I will print off and, when feeling brave enough, approach my new RIB with a screwdriver and menacing smile! Question is, do I feel brave enough! 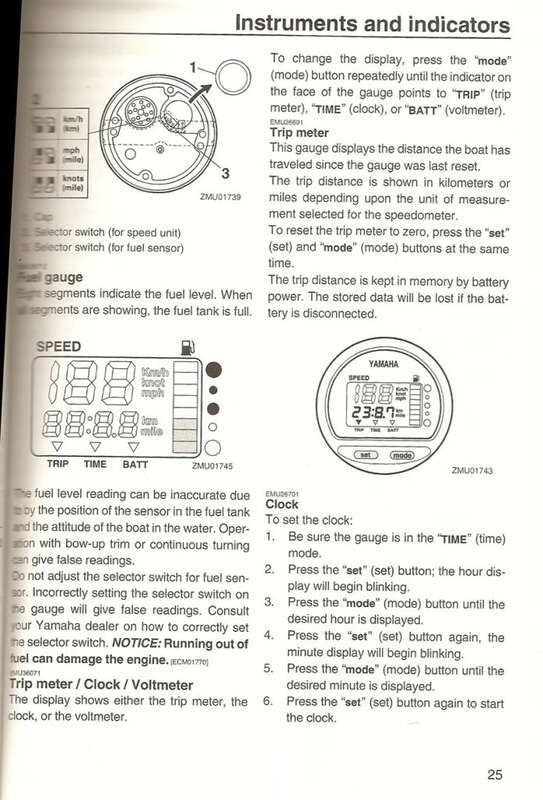 EDIT: I've found the dip switch picture - it's in the engine manual, not the gauges manual! Hi Ian - that's a kind offer, thanks. Engine manual....gauges manual - it's in some manual and at least you found it.